From the back tee this 352m Par 4 is an intimidating tee shot even to the best of golfers, with the mighty Murray River and out of bounds lurking on the left and a vast stand of pine trees to the right. 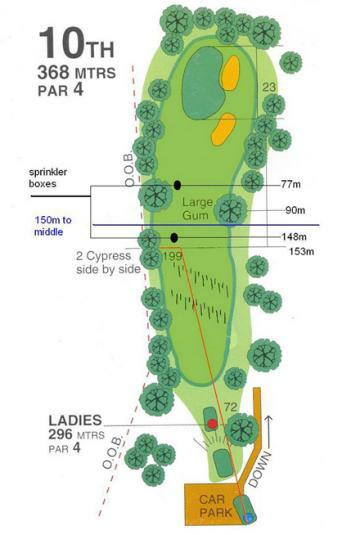 With the tee well above the level of the fairway a short shot of the tee will carry 1 to 2 clubs more, so the player can afford to be cautious, as to position the ball on the centre left of the fairway. This green is deceptively small so aiming to the middle is a good play.